More suspected data manipulations in the papers by the French elite biologists. It was funny enough when the director and several lead figures at the Strasbourg CNRS institute for plant sciences IBMP, former home of the master data manipulator Olivier Voinnet, and even the institute’s evaluators, were found to sport quite a lot of shifty-looking data in their papers. This time, the irony is just too much. Catherine Jessus, developmental biologist specialising on cell cycle research on oocytes and director of CNRS l’Institut des sciences biologiques (INSB) was in charge of two misconduct cases, and now the data integrity of her own papers is called in question. One investigation led by Jessus was about, whom else, Voinnet and his IBMP sidekick Patrice Dunoyer. In summer 2015, Voinnet was barred from CNRS for 2 years (which sounds worse than it is, because his professorship at ETH Zürich in Switzerland remained untouched, read here), and Dunoyer was suspended for one entire month. Jessus’ secret investigation ended with no documents whatsoever but a terse press release made available to outsiders. 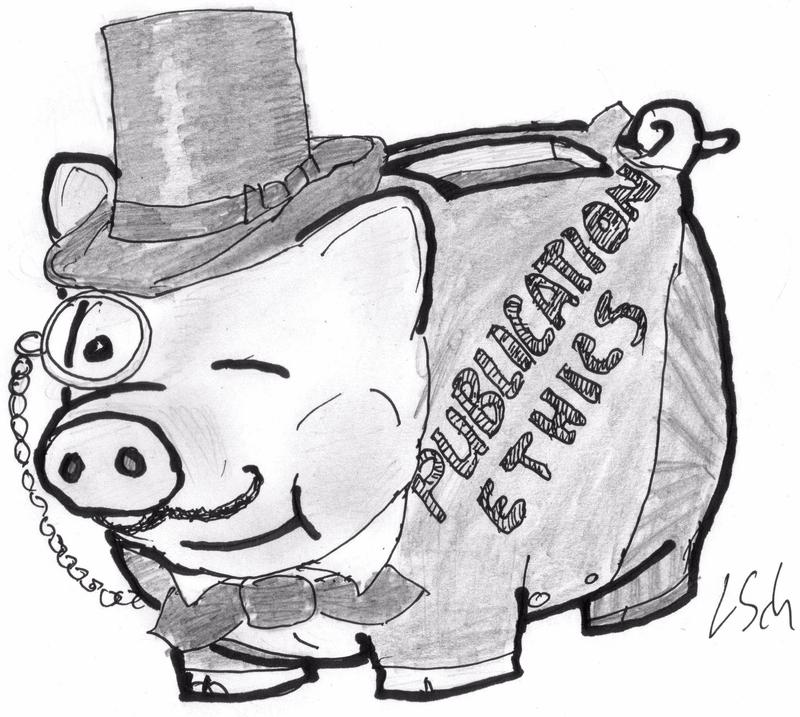 Both Voinnet and Dunoyer are by now back to publishing papers in prestigious journals. Jessus was also in charge of dealing with the misconduct evidence against Voinnet’s former postdoc Charles-Henri Lecellier, whom the mighty plant scientist (according to my sources) banned from his Strasbourg lab because he did not trust his research results. It seems Lecellier started to fudge data already during his PhD at CNRS Hôpital Saint-Louis in Paris (PubPeer record here). Imagine how bad it must get that Voinnet expels you for data manipulation! The tenured CNRS researcher was hence moved out of Voinnet’s sight, to work as group leader at the Institut de Génétique Moléculaire de Montpellier, where he continued his own line of data rigging, helped by his trusted friend from IBMP, Guillaume Vetter (see my earlier reporting for a German magazine here and here). 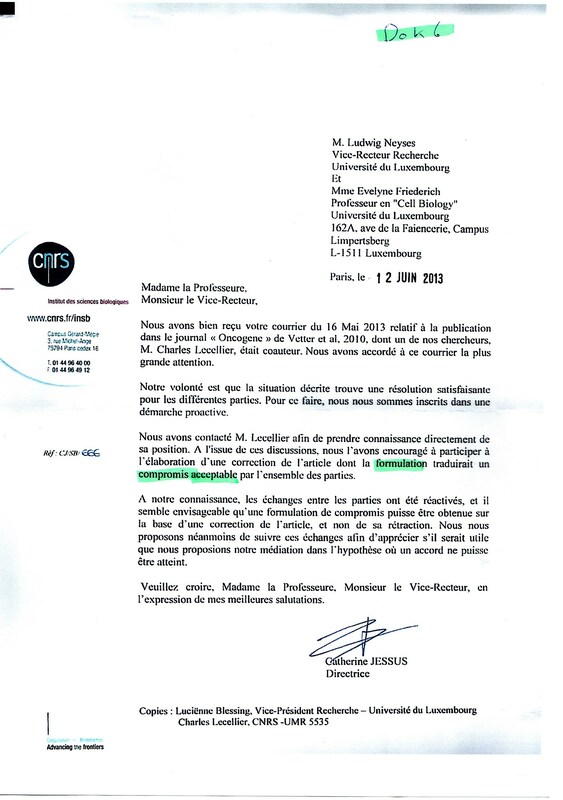 Apparently, with full protection from CNRS: in 2013 Jessus actively opposed on behalf of CNRS the impending retraction of a Lecellier co-authored paper, despite earlier misconduct findings against his partner Vetter at the University of Luxembourg (evidence here, especially this letter, example of data manipulations here). The university’s and last author’s requests of retraction to the NPG journal Oncogene were initially overruled by Lecellier’s and Jessus’ insistence to issue a correction instead, but the paper Vetter et al 2010 was eventually pulled in December 2015 following my reporting. Nothing at all happened to other problematic papers by Lecellier, one of most troublesome of which was Saumet et al 2008, where real-time PCR data was selectively “modified” to accommodate peer reviewer criticisms (see highlighted changes here and Lecellier’s originally submitted manuscript here). The journal Blood, published by American Society of Hematology, ignored all that evidence, and so did CNRS and Jessus. Now, I was presented with some evidence of inappropriate data handling in Jessus’ own papers. It doesn’t look like the “mistakes” were accidental, whoever did them. Does this explain Jessus’ understanding stance towards Lecellier and Voinnet? I wrote to her, but just as my Voinnet inquiries over 2 years ago, I received no reply. There is only one way to resolve this: Olivier Voinnet, whose ban from CNRS has now expired, should return and investigate Catherine Jessus, to complete the circle. So here are four Jessus papers, and the evidence I was forwarded. Two highlighted bands in Figure 3C of Karaiskou et al 1999 appear duplicated, which can never happen by mistake. Update 6.09.2017. This new evidence regarding Karaiskou et al 1999 was forwarded to me by another reader of my site. The first author Anthi Karaiskou is now associate professor at Pierre and Marie Curie University in Paris. A band seemingly duplicated in Fugure 3B also seems to appear in Figure 5D (red). Other potential band duplications labelled in green and blue. Two highlighted bands in Figure 6C of Karaiskou et al 2004 appear duplicated, and slightly shifted. 3. Zhao Y, Haccard O, Wang R, Yu J, Kuang J, Jessus C, Goldberg ML. Roles of Greatwall kinase in the regulation of cdc25 phosphatase. Mol Biol Cell. 2008 doi: 10.1091/mbc.E07-11-1099. Figures 4 (top) and 8B (bottom) of Zhao et al 2008 share similarities, highlighted in green. the experimental conditions are according to figure legends however somewhat different. Red and yellow show that both Plx1 (MW 120kDa) and Cyclin A1 (MW 47kDa) panels are part of the same gel. However, the red frames are offset, and the samples do not match anymore. Panels Cdk1 in Figure 4B of Daldello et al 2015 are seemingly duplicated. Yet on the right-hand side, the panel is shown as broken by a vertical line, which indicates a gel discontinuation. We see of the left-hand side that the panel is actually continuous. Dupré A, Daldello EM, Nairn AC, Jessus C, Haccard O.
Phosphorylation of ARPP19 by protein kinase A prevents meiosis resumption in Xenopus oocytes. Update 22.09.2017. For those who thought the data integrity issues in Jessus lab were ancient history, this paper Dupre et al 2017 was just published in Cell Cycle. Some say gel splicing was used to perfectly acceptable 10 years ago, but never irregular splicing like below. And this paper is just 2 months old. Update 21.02.2018: CNRS now released the UPMC report, after I published this article. It is scary. Data manipulation was declared to be good scientific practice, while CNRS now publicly demands my head. Cases 1 and 2 warrant an investigation, especially because it has the same first author. Cases 3 and 4 may be something different than cheating, although it should be given a look. However, I can’t follow your argumentation that Jessus should be especially named, since she is not first author of any of these articles, and she is only corresponding author of one of them. Anyway, with five years between duplications 1 and 2, and their boldness and stupidity (not sophisticated doping, Chris Surridge would say), you should be able to find more duplications of whoever who did this. “However, I can’t follow your argumentation that Jessus should be especially named, since she is not first author of any of these articles, and she is only corresponding author of one of them.”. Isn’t she senior and corresponding author on number 2? I agree with the infamous Chris Surridge that many scientists cheat. In contrast to him, I do not believe that such is reason to forget and forgive the top of the iceberg, but that this iceberg-top should be severely punished to scare the rest of the would-be cheaters. Given the frequency of the cheating, I don’t think Jessus is an exception as a group leader by having some people in her group that were caught having done so. Only if there is a pattern, or if the cheating should have been obvious, the group leader becomes culpable. I blame Jessus for letting Patrice Dunoyer be an independent scientist and a single corresponding author; people like him lost that right. In the future, I may blame Jessus for not adequately dealing with the current new accusations. But I simply don’t see why she should be the first major target of an investigation into the four problematic issues now posted by Leonid. I agree with Silver that the frequency of the cheating is very high and to that extend, Jessus is not an exception. What makes it more complicated is her position at the head of the CNRS Biology department : it indicates that anybody may face misconduct at any time. Anyway, I am sure that these issues will be adequately corrected. I think the lab heads will be always the main responsibles for what happens in their labs and to supervise the experimental work and verify the raw data…what it might happen it that in certain circumstances it may be as well difficult to an experienced lab head to detect the frauds of their lab members when it happens they are habilidous cheaters capable of deceiving the most experienced lab head….but this is very difficult to happen…. Isn’t being senior and corresponding author enough? The gel in number 2 appears to be heavily manipulated: there are several cuts that do not follow the design of the experiment. I’ve been trying to post comments about the Jessus papers on Pubpeer but it looks like they are not positively moderated. Is this due to the fact that Drs Stell and Barbour are CNRS employees? PubPeer has an extremely slow moderation queue, worth a wait maybe? 2. If you have new evidence, or factual comments on the available evidence, please share here. Thanks Leonid. Did you post the updates regarding Jessus papers on pubpeer? With this Jessus gate, the CNRS shows the symptoms of the true melancholy. Pubpeer, which is a CNRS object through Stell and Barbour, appears as a tyrannical superego that triggers a self-destructive behavior putting the CNRS survival at risk. After destroying Voinnet and co-authors (as well as the “stinking fish of Strasbourg” as described by Schneider), Pubpeer et al. is now scrutinizing the head of the Biology Institute, Catherine Jessus, the person who promoted Pubpeer. All of this can be seen as the structure of a melancholic response and it does not sound like good news. Dev Biol. 2001 Mar 1;231(1):279-88. Interplay between Cdc2 kinase and the c-Mos/MAPK pathway between metaphase I and metaphase II in Xenopus oocytes. Frank-Vaillant M1, Haccard O, Ozon R, Jessus C.
Laboratoire de Physiologie de la Reproduction, INRA/ESA-CNRS 7080, Université Pierre et Marie Curie, boîte 13, Paris Cedex 05, 75252, France. J Cell Sci. 2000 Apr;113 ( Pt 7):1127-38. Progesterone regulates the accumulation and the activation of Eg2 kinase in Xenopus oocytes. Frank-Vaillant M1, Haccard O, Thibier C, Ozon R, Arlot-Bonnemains Y, Prigent C, Jessus C.
Laboratoire de Physiologie de la Reproduction, INRA/ESA-CNRS 7080, Université Pierre et Marie Curie, boîte 13, 75252 Paris Cédex 05, France. Problematic data figures 8A and B.
Dev Biol. 1998 Dec 15;204(2):592-602. Inhibition of small G proteins by clostridium sordellii lethal toxin activates cdc2 and MAP kinase in Xenopus oocytes. Rime H1, Talbi N, Popoff MR, Suziedelis K, Jessus C, Ozon R.
INRA/ESA-CNRS 7080, Université Pierre et Marie Curie, 4 place Jussieu, 75252 Paris Cédex 05, France. Benefit of the doubt wears off with each problematic datum. This number of picture duplications, by various authors, probably needed a culture which was condoned or even fostered by the leading scientists. The two Karaiskou articles should be retracted, and there should be an investigation into the culture which allowed these many duplications. That investigation should also involve the roles of Ozon and Jessus. So, Zebedee, you got me change my mind with your new findings of picture duplications. Sun Tzu famously said, if only one scientist cheats, punish that scientist, but if more scientists cheat, punish the lab leader. Il vaut mieux avoir affaire à Dieu qu’à ses saints.